From Earth, the outermost planet has never looked so good. Scientists have upgraded one of Earth’s most powerful telescopes to help it compensate for the atmospheric light-scattering that can make photos taken by ground-based telescopes appear blurry — and stunning new images of star clusters and Neptune show just how sharp such photos can now be. 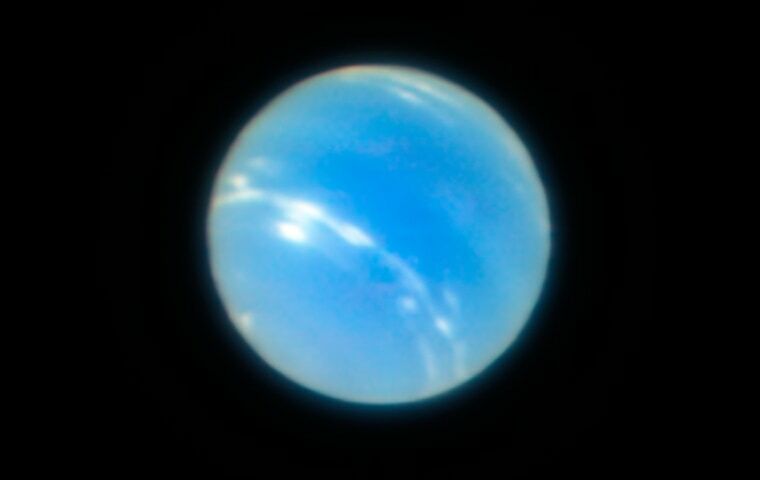 Before the upgrade, photos of Neptune taken by the European Southern Observatory’s Very Large Telescope (VLT) in Chile’s Atacama Desert showed the planet as a fuzzy blue spot. In the new photo, it appears as a blue disk with subtle color shadings and sharply defined edges. You can even see evidence of cloud activity. The photos are so crisp that they rival those taken by the Hubble Space Telescope. Over the past three decades, Hubble has captured some of astronomy’s most iconic images from its orbital perch high above Earth’s atmosphere — but it's able to accommodate only a fraction of the astronomers who would like to use it. VLT’s new capability was made possible by the addition of the Multi-Unit Spectroscopic Explorer (MUSE), an instrument that helps correct "atmospheric blur" using a technique known as adaptive optics. Light from celestial objects scatters as it collides with air molecules in Earth's atmosphere on its way to our vantage point on the planet's surface. Along with other instruments on the telescope, MUSE corrects these distortions by shooting laser beams into the sky to create “artificial stars” and then measuring how light from the faux stars is distorted. The telescope’s thin, deformable mirror compensates by shifting its shape 1,000 times a second to correct the distorted light. Of course, one good image of Neptune is just the beginning. Once it’s fully dialed in, the upgraded telescope will be used to study all sorts of celestial objects, including stars, supermassive black holes and supernovas as well as other planets and their moons — all in unprecedented detail.